To make innovative discoveries that have an impact on the treatment of common diseases is our mission – clearly ambitious and unpredictable. We tackled the topic at our recent Annual Forum, ‘Unleashing Innovation’, held at The Deakin Edge at Fed Square on the 20th of May. It is clear that success in medical research requires knowledge, creativity and imagination, drive and determination, and luck as well. Our Year in Review, which was hot off the presses at the Forum, gives us a glimpse back into the past year at SVI, and affirms that the combination of excellent people, up-to-date technology and equipment and an open, collaborative environment are essential building blocks for breakthroughs. Especially important are young scientists and it is striking how many major achievements there have been recently amongst this group, including Victoria Fellowship recipient David Ascher and Sabine Jurado, whose PhD studies were published in prestigious journals, leading to a number of awards. A little further up the scale of seniority are researchers emerging as independent investigators, such as Jon Oakhill and John Scott who in 2013 began their first NHMRC-funded research as independent investigators, focused on the protein AMP-activated protein kinase, which controls the body’s fat and glucose metabolism. You will read in this edition of The Edman that the ACRF Rational Drug Discovery Centre was officially launched at the Institute in May. This boost to our technology platforms will enable collaborative work into early drug discovery for new cancer treatments. While the news from the recent Federal Budget was not as grim for medical research as feared, we are determined to reduce our reliance on government. Especially exciting has been the recent emergence of strong philanthropic interest in SVI from a new generation of donors, including the Breakthrough Committee and the 5point Foundation. Philanthropic support has never been lacking from our SVI Foundation Chair, Susan Alberti, who hosted the recent Susan Alberti Medical Research Foundation Mother’s Day Luncheon. Proceeds from the Luncheon were donated towards the Susan Alberti Women in Research Award, the inaugural recipient of which was Dr Kate Graham, from our Immunology and Diabetes Unit. We are very grateful to all of you, our supporters, who give our researchers the ability to ‘unleash innovation’. One in two Australians will be diagnosed with cancer in their lifetime and over 100,000 new cases are diagnosed every year. Although survival rates have increased significantly over the past 20 years, cancer remains a leading cause of death: every year over 36,000 Australians die of the disease. One in eight Australian women will be diagnosed with breast cancer in their lifetime. That could be thirty of the girls from your high school graduating class, five of the women on the tram with you in the morning or three sitting next to you at the movies. Those statistics are shocking enough: however, if your family carries a mutation in one of the ‘breast cancer genes’, BRCA1 or BRCA2, the risk of developing breast cancer increases to 80%. Like Angelina Jolie, women with these mutations are often advised to have a mastectomy to avoid the risk of developing breast cancer. Dr Andrew Deans, from SVI’s Genome Stability Unit, was awarded a postdoctoral fellowship from the National Breast Cancer Foundation (NBCF) in 2012, to fund his work into the breast cancer gene BRCA2 and related proteins. He goes on to say that the disease can be caused by a mutation in the ‘breast cancer gene’ BRCA2, which impairs the cell’s ability to repair DNA damage, resulting in cancer. 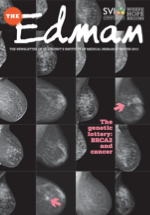 If you are unlucky enough to carry a mutated copy of BRCA2, your risk of getting breast or ovarian cancer is considerably increased compared to the general population. If you carry two copies, you will have Fanconi Anaemia. By reconstructing the DNA repair mechanism in which BRCA2 is involved, Andrew aims to understand the connection between familial breast cancer and Fanconi Anaemia. This may lead to new strategies for treatment of both conditions. The new Australian Cancer Research Foundation (ACRF) Rational Drug Discovery Centre at SVI was officially opened in May. The Centre, which will focus on early drug discovery for new cancer treatments, includes $2 million worth of cutting-edge equipment. ACRF Chairman Tom Dery and Chief Executive David Brettell attended the opening, acknowledging the work and expertise of the Centre’s Chief Investigators, Professor Michael Parker, Associate Professor Louise Purton and Doctor Carl Walkley. "The research taking place in this new Centre is laying the groundwork for the kind of major advances in cancer research in Victoria that the ACRF is committed to funding,” said Mr Brettell. SVI’s Director, Professor Tom Kay said that the new Centre will help bridge the gap that exists between academia and industry in the drug discovery pipeline. Steve Harris, who attended the launch, is a perfect example of the power of research. In 2004 he was diagnosed with acute promyelocytic leukaemia, a blood cancer that affects a certain population of white blood cells, and was given 2 weeks to live. Nine years after his diagnosis and treatment, Steve’s chances of relapsing now approach those of anyone else in the male population contracting the disease. “Without the work that went into developing new treatments for the type of leukaemia that I had, I wouldn’t be here today. It's not just the survival rate that research adds to the equation, it's the impact of the treatment.” Mr Harris said. Finding better cures means not only identifying how the cancer arises, but also developing drugs that target the cancer cells. The new Centre will allow SVI’s researchers to do just that. Drs Sophie Broughton and Urmi Dhagat have joined forces in SVI’s Structural Biology Unit to make an impact on the blood cancer leukaemia. Since arriving in the Unit with their newly minted PhDs in hand, the young researchers have had a number of successes. Sophie was recently awarded a Leukaemia Foundation Postdoctoral Fellowship to pursue her work on new treatments for acute myeloid leukaemia, an aggressive cancer targeting white blood cells. Survival rates for this type of leukaemia remain poor. Sophie’s project involves examining the three-dimensional structure of an antibody with potential as a treatment for the disease. Urmi’s research, funded by the National Health and Medical Research Council, revolves around investigation of the structure of a protein, called the interleukin-3 receptor, which is linked to the development of leukaemia. Sophie and Urmi recently received a joint grant of $30,000 from the Margaret Walkom Bequest to fund a high-resolution microscope for their research. These grants are supporting the two to further their expertise in the cutting-edge field of structural biology and drug discovery. Sophie says “My background in protein expression through to crystallisation and Urmi’s strengths in medicinal chemistry and structural biology provide us with a broad skill set that is a great advantage to us in our shared projects.” Urmi adds, “We often bounce ideas off each other, which motivates us to try new things and think outside the box”. Combined, their passion for medical research, access to cutting-edge technologies and world-class expertise, gives these young researchers every chance of further success. Breast cancer survival rates have increased dramatically: in the last 30 years, 5-year survival rates have increased from 72 to almost 90 percent. Margaret was diagnosed with breast cancer in 1990 and underwent a mastectomy and chemotherapy as a result. “I was 46 and in good health (I thought), when I noticed a small lump in my breast, but it didn't alarm me as a lump that had been removed previously had turned out to be benign. My GP wasn’t really concerned about it, and recommended that I wait a month to see what happened, but something in the back of my mind told me that I should take it more seriously. I insisted that he do an ultrasound and biopsy. When I woke from the anaesthetic, my husband and the surgeon were there and one of them said “It’s cancer”. I was a bit stunned and, after talking to the oncologist, I felt quite aggressive towards it, wanting to get rid of it completely as soon as possible. I had a mastectomy, removal of 23 lymph nodes under my left arm and chemo, and eventually was given the all clear. I have been ‘cancer free’ for 23 years, but each year when I have a mammogram and general health check, I have a nasty sinking feeling that this might be the year it reappears. The most unexpected and delightful outcome of having cancer was that I found out how many people truly cared about me, people who I would have thought of as only peripheral to my life. Cancer had the effect of removing my ‘stiff upper lip’ and I find myself at unexpected times being moved to tears at the sheer joy of being alive. Support cancer research at SVI. SVI staff and supporters gathered at the Deakin Edge at Fed Square on a stormy Melbourne afternoon in May to explore the topic ‘Unleashing Innovation’ at SVI’s Annual Forum. Leigh Dayton, Science Writer and Broadcaster kicked off the conversation by challenging the audience with some of Australia’s shortfalls, saying that while Australia has had extraordinary research successes, we haven’t managed their transition into products, technologies and services as well as we could. Dr Andrew Cuthbertson, R&D Director and Chief Scientific Officer of CSL focused on the “D part of R&D”, speaking of the huge effort, in terms of target molecule and clinical testing that is required to bring a drug to market. From a young person’s perspective, Marita Cheng, 2012 Young Australian of the Year, spoke of her experience founding ‘Robogals’, an international, student-run organisation focused on introducing young women to engineering and technology. There is particular focus in the medical research community on the ‘Valley of Death’, a subject touched on by both Andrew and Leigh. This is where potentially exciting research discoveries can languish when they fail to pique industry interest and therefore do not lead to benefits for patients. This gap has become an area of philanthropic focus at SVI, with donor Colin North funding two projects with potential therapeutic benefit in the areas of bone cancer and Alzheimer’s disease. The Forum highlighted the talent and interest in the sector, which, combined with support from philanthropy and industry, will help unleash innovation to the benefit of all Australians. Australian of the Year, Ita Buttrose AO, OBE inspired a packed house at Leonda by the Yarra in Hawthorn at the hugely successful Susan Alberti Medical Research Foundation Mother’s Day Lunch. Susan Alberti said the lunch is expected to become an annual event, dedicated to raising money to support the careers of women in research at SVI. The Award, named in Sue’s honour, aims to support the work of an outstanding female scientist, by helping to alleviate the adverse impact on their research caused by maternity leave. The most crucial years in a female researcher’s career commonly coincide with child-bearing and raising a family. Type 1 diabetes researcher and mother of two, Dr Kate Graham, who attended the lunch with her husband Tim and her son Harrison was the first recipient of the Award. The grant will help fund a research assistant or postdoctoral fellow to continue experiments for Kate until she returns to work. Kate, who gave birth to Harrison in April, is currently on maternity leave. A moving short film featuring three of SVI’s leading female researchers; Associate Professors Natalie Sims, Louise Purton and Helen Thomas, was viewed by guests at the lunch. It showed the challenges the three researchers face balancing life in the lab with motherhood, however it also highlighted the rewards both roles bring. The short film can be viewed at http://www.svi.edu.au/join_us/events/mothers_day. Support the Women in Research Award. The next $10,000 Discovery Fund event hosted by Christine will be held at SVI in August. It will give new members a chance to see and visit the Institute and labs where the scientists work, as well as allow the members to see more of the work to which they are contributing. If you would like more information about the Fund, contact Christine via the SVI Foundation on (03) 9288 2480. The nutritional intake of Australia’s sporting elite has been under the spotlight in recent months, so it was no surprise that an SVI event held in March on the topic of ‘Food for Thought in Sport’, sparked much discussion between guests. Experts from the nation’s leading sporting clubs including Dr David Buttifant, Sports Science Director at the Collingwood Football Club, Simone Austin, Dietician for the Hawthorn Football Club and Andrew Redmayne, Goalkeeper for the Melbourne Heart, provided insights and tips at the Friends of SVI event. Chair of the Friends of SVI, Bernadette Dennis, hosted the night, which is the second successful event held in the ‘Food Matters’ series and a chance for SVI to thank its loyal supporters as well as reach out to a new audience. “The event was a fun way to recognise and acknowledge those who have financially assisted SVI over the past 10 years. It also enabled us to engage with a broader base of loyal donors, as well as encourage new friends, to embrace SVI and champion the cause,” Bernadette said. Tours of the labs ran before the event, giving guests an insight into SVI’s research into type 2 diabetes and heart disease. After the evening’s success, the ‘Food Matters’ event series will continue annually for the Friends of SVI (previously known as the SVI 1000 Club). Join the Friends of SVI. Doris Young began her direct involvement with SVI as a member of the SVI 1000 Club, now known as Friends of SVI. After touring the Institute and talking to some of SVI’s students, Doris and her husband Jim Best were inspired to sponsor a PhD student at SVI. In March Doris and others who support SVI Foundation Top-up Scholarships met with their sponsored PhD students at a morning tea held at the Institute. The sponsors were invited for an in-depth tour of the labs and to learn more about their student’s project. Prerak Trivedi, the PhD student sponsored by Doris and Jim, works under supervisor Associate Professor Helen Thomas in the Islet Biology Laboratory. Prerak’s research focuses on finding ways to stop the death of insulin-secreting beta cells in type 1 diabetes. He is involved in testing drugs that interfere with the cells of the immune system, which are responsible for killing beta cells, and aims to develop new therapies for people with the disease. Thanks to Doris Young and other SVI supporters who have established named scholarships, these PhD students can further their research into prevention and treatment of diseases such as diabetes and cancer. It is extraordinary to think that St Vincent’s Institute of Medical Research owes its existence to one man: John ‘Jack’ Holt. Jack was a famous Melbourne racehorse trainer, the Bart Cummings of his time. When he died in 1951, he left a bequest to establish medical research at St Vincent’s, which came into being on the 23 of April, 1953. Your bequest could also make a profound difference. In Australia today 30% of people surveyed say they intend to leave a gift to charity in their will, yet only around 7% actually do. While there are a number of reasons for this, interestingly one of the main ones is that no-one ever asked them to consider making a bequest in their will. So now at SVI, we are asking. We are inviting all our friends, supporters, staff, volunteers and donors to consider leaving a portion of their estate to SVI. It’s a common misconception that only wealthy people leave money to charity when they die. The reality is that most bequests are made by ordinary people who want to make a positive difference, with most bequests ranging from $10,000 – $65,000. SVI invited Gerald Snowden to become the patron of The Jack Holt Society. Gerald, who recently lost his wife after illness, has embraced the position enthusiastically. There are now ten active members of the Society and we would love to talk to you about joining. Interested? Chat with Bequest Officer Clare Lacey; book in for a tour; or catch up for a coffee with Gerald. Call us on (03) 9288 2480. We can’t afford to lose members of our precious research talent pool, especially while we face health challenges like cancer and increases in the number of Australians affected by type 2 diabetes and Alzheimer’s disease. The majority of science undergraduates are women, but sadly relatively few make it to the senior ranks of medical research. A successful research career relies on continuous research output. Many female researchers with children seek alternative career options because of the difficulties of maintaining output while raising young children. The SVI Women in Research Award aims to do something about this. The Award will alleviate some of the pressure on female researchers at SVI who take maternity leave by contributing $15,000 to fund a research assistant to continue their experiments in the lab until they return to work. My Susan Alberti Medical Research Foundation has provided the seed funding to establish this award, with the inaugural recipient being SVI researcher Dr Kate Graham, who recently gave birth to her second son, Harrison. Dr Graham is an expert in type 1 diabetes, a disease that affects more than 140,000 Australians, many of them diagnosed in childhood. Type 1 diabetes is an issue close to my own heart. My only daughter Danielle died at the age of 32 from complications arising from type 1 diabetes, making me determined to find a cure for this chronic disease. Both medical research and motherhood are challenging. Combining them requires great talent, determination and support from the community. There are other women like Dr Graham at SVI who need our support so they do not have to choose between motherhood and research. I am personally inviting you to consider a gift today. Please join me in this extraordinary initiative.